Spartan Group X. GoRuck. 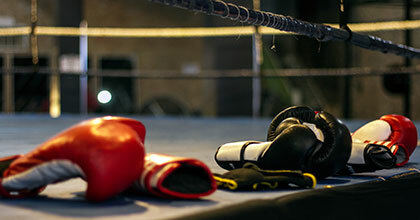 Boxing. It's all here. The gym has officially gone Hollywood on us. Neon strobes overhead. People attempting to dance with stationary bikes. Something called aerial yoga. 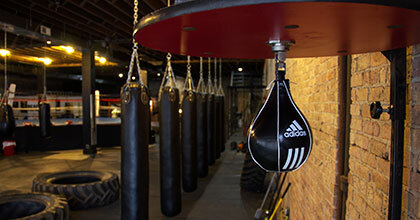 Skip the glitzy hoopla and embrace your inner Balboa at Reach Beyond Fitness, a two-floor,16,000-square-foot boxing and training facility, now taking members in West Town. This is the kind of joint that brays for blood, sweat and tears. Inside: an old-school stomping ground of brick wall and exposed ceiling beam. And gracing the main hall: one four-posted boxing ring, surrounded by a choice array of heavy bags, speed bags and kettlebells. In your corner: legendary Chicago boxing coach Arturo Salas, who has 45+ years of boxing and training under his belt. He’ll lay down the groundwork and help you find your rhythm with bag-work, mitt-work and conditioning. Workouts typically last just over an hour and can be adjusted to any skill set. Just keep your towel close. And don’t throw it in.